We’d love your help. Let us know what’s wrong with this preview of Game Time by Roger Angell. Roger Angell has been writing about baseball for more than forty years . . . and for my money he's the best there is at it," says novelist Richard Ford in his introduction to Game Time. Angell's famous explorations of the summer game are built on acute observation and joyful participation, conveyed in a prose style as admired and envied as Ted Williams's swing. Angell on F Roger Angell has been writing about baseball for more than forty years . . . and for my money he's the best there is at it," says novelist Richard Ford in his introduction to Game Time. Angell's famous explorations of the summer game are built on acute observation and joyful participation, conveyed in a prose style as admired and envied as Ted Williams's swing. Angell on Fenway Park in September, on Bob Gibson brooding in retirement, on Tom Seaver in mid-windup, on the abysmal early and recent Mets, on a scout at work in backcountry Kentucky, on Pete Rose and Willie Mays and Pedro Martinez, on the astounding Barry Bonds at Pac Bell Park, and more, carry us through the arc of the season with refreshed understanding and pleasure. This collection represents Angell's best writings, from spring training in 1962 to the explosive World Series of 2002. To ask other readers questions about Game Time, please sign up. I bought this primarily to read 'The Web of the Game' Angell's 1981 account of watching Ron Darling and Frank Viola's pitchers duel in the company of 'the old man to my left' who is revealed to be Red Sox legend and hall of famer Smokey Joe Wood. It might be the best piece of sports writing I've ever read. When I narrated some to my partner she really hit on what makes Roger Angell so special - he writes non-fiction like fiction. And it's this ability to create vivid pictures through literary me I bought this primarily to read 'The Web of the Game' Angell's 1981 account of watching Ron Darling and Frank Viola's pitchers duel in the company of 'the old man to my left' who is revealed to be Red Sox legend and hall of famer Smokey Joe Wood. It might be the best piece of sports writing I've ever read. When I narrated some to my partner she really hit on what makes Roger Angell so special - he writes non-fiction like fiction. And it's this ability to create vivid pictures through literary metaphor that makes him unlike anyone else. Other stand outs in this book include the profile of Bob Gibson in retirement, how the most feared pitcher alive whose ferocity and exacting standards on the pitch had left him a little adrift in civilian life. 'Jacksonian' the essay on the 1977 World Series and particular Reggie Jackson that includes a turn of phrase that's not left my mind yet. "The other Reggie came up to bat in the 4th inning (he had walked in the second) and instantly pulled Burt Hooton's first delivery into the right field stands on a low, long parabola, scoring Munson ahead of him and putting the Yankees ahead for the rest of the game and the rest of the year." It could only be written in a concluding game of a World Series but the simple addition of 'the rest of the year' provides a whole context of finality in 5 words. 'Ninety Feet' the account of the 1991 World Series (Often called the greatest series ever played) and Lonnie Smith's base-running error that cost the Braves the series "The Braves, who had fought a series-long succession of battles up and down the narrow salient between third and home, came up ninety feet short for the year" What a dagger through the heart. Roger Angell writes about baseball from the viewpoint of an intelligent fan sitting in the bleachers. This book is a collection of his baseball writing from The New Yorker Magazine and I successfully stretched the essays over an entire summer. What a pleasure! I’ve been reading Roger Angell since high school, many of which I’d read more than once. While baseball writing in general has undergone a shift from general storytelling to deeper analysis, this author has the ability to appeal to almost anybody with a love of America’s greatest sport. “Game Time” is essentially a greatest hits of his work, so it must have taken some effort to pare down the contenders. We have his 1975 appearance at Candlestick Park with Horace Stoneham, the 1981 college game f I’ve been reading Roger Angell since high school, many of which I’d read more than once. While baseball writing in general has undergone a shift from general storytelling to deeper analysis, this author has the ability to appeal to almost anybody with a love of America’s greatest sport. “Game Time” is essentially a greatest hits of his work, so it must have taken some effort to pare down the contenders. We have his 1975 appearance at Candlestick Park with Horace Stoneham, the 1981 college game featuring Frank Viola and Ron Darling but starring Smokey Joe Wood, as well as a lengthy interview with Bob Gibson, to name just a few. One gets the sense that while Angell really loves the sport, he has the ability to write at will about almost anything (although it seems the bulk of his efforts are in fact about the diamond). I especially enjoyed the later additions to this collection, in particular the synopses of the 2001 and 2002 World Series, the latter of course including the infamous Game 6 during which Giants manager Dusty Baker gave starting pitcher Russ Ortiz the game ball. While many a writer alienates his subjects, Angell got through to almost everybody. I didn’t have the highest opinion of Tim McCarver, but Roger makes him likeable. Nor was I exactly enamored by the likes of Reggie Jackson and Pete Rose, but this writer makes them human. It’s also interesting that the author prefers the sometimes over-grittiness of the Yankee style as contrasted to the alleged goody two shoes characterization the Dodgers want to present themselves as. Angell is now 97, and ostensibly in good health. To many more quality years Roger! My 1st taste of Roger Angell, on recommendation of Tom Verducci. Roger is widely considered to be one of the all-time greats of baseball writing, and after reading this book I understand why. This book is a collection of Angell's baseball columns through the years (1962 up to 2002). He is 96 years old as of this review and still writing about baseball to the best of my knowledge. His depth and breadth of game knowledge, as well as his skill in writing about it, seem to have only grown over the ye My 1st taste of Roger Angell, on recommendation of Tom Verducci. Roger is widely considered to be one of the all-time greats of baseball writing, and after reading this book I understand why. This book is a collection of Angell's baseball columns through the years (1962 up to 2002). He is 96 years old as of this review and still writing about baseball to the best of my knowledge. His depth and breadth of game knowledge, as well as his skill in writing about it, seem to have only grown over the years, as I notice that the stars I placed next to the essays I wanted to read again in this book seem to be more numerous in the later years. His end-of-season synoptics tend to be my favorite, and if a book could be published that just contained all of those, I would buy it. This book gets 3 stars only because I'd read about 1/3 of the book over again. This happens in an anthology I'm afraid. Some essays are close to 5 stars, others are 2.5-3. I'd rate the entire book a 3.49 on average if I could. I highly recommend Angell to anyone who loves the game of baseball and who also appreciates the history and nuance of the game through the years. The essays on Bob Gibson and Tim McCarver were the best, along with Richard Ford's intro. Roger Angell is a fantastic baseball writer with felicitous prose, a keen eye, and an irrepressible love for the game. Angell is a beautiful writer who carefully balances baseball's mystique with a healthy awareness of the limits of its significance. Baseball and good writing go together like a four seam fastball and a sweeping curve ball. No one is better than Roger Angell. Like his stepfather, E.B. White, he can turn a sweet pivot in mid story that makes you see things in an unexpected way. He's a reporter and a fan who never forgets that it's only a game and that the game's the thing. Memory is part of the game. Angell goes back to the days of the Carl Hubbell Giants at the Polo Grounds. The essays were written between 1962 and 2002. My f Baseball and good writing go together like a four seam fastball and a sweeping curve ball. No one is better than Roger Angell. Like his stepfather, E.B. White, he can turn a sweet pivot in mid story that makes you see things in an unexpected way. He's a reporter and a fan who never forgets that it's only a game and that the game's the thing. Memory is part of the game. Angell goes back to the days of the Carl Hubbell Giants at the Polo Grounds. The essays were written between 1962 and 2002. My favorite is the description of attending a college game-- Yale and St. John's-- in 1982. With Angell is Smokey Joe Wood: former Red Sox pitcher and the hero of the 1912 World Series. That's right-1912. A nice trip down memory lane, except there's the game itself. Ron Darling for Yale against Frank Viola for St. John. Darling would star for the Mets, Viola would be a Series MVP and Cy Young winner for the Twins. What George Will would be if he could write, or think clearly. Easily the best of the veteran-baseball-writer-collected-essays subgenre of baseball nonfiction. His long piece on Bob Gibson is almost as good as Gibson's autobiography, Stranger to the Game: the Autobiography of Bob Gibson, which is in turn the best baseball autobiography I have ever read. I have them both as 4.5 star books. Angell runs a little too nostalgic which holds this back from being 5 stars for me, but he's an astute observe What George Will would be if he could write, or think clearly. Recommends it for: Those who would sacrifice bunt. i just gave up after the 2nd week of falling asleep a page or two along. Very solid collection of great columns by Roger Angell. I'm a big Joe Posnanski fan and last Christmas he had posted a list of his all-time favorite sports books. I think I added about 20 of them to my "to read" list and this was one of them. Highlights for me were the pieces he had done on Bob Gibson and David Cone. Recommended if you are looking for some baseball reminiscing and enjoy the always-elusive quality sportswriting. Still good. Disappointing to reread some of the essays, even though they're obviously among Angell's best. But they should have organized these collections is a more orderly way, no? Even within the collection, it's confusing that the essays aren't even chronological within the subjects. Great book for all baseball fans! 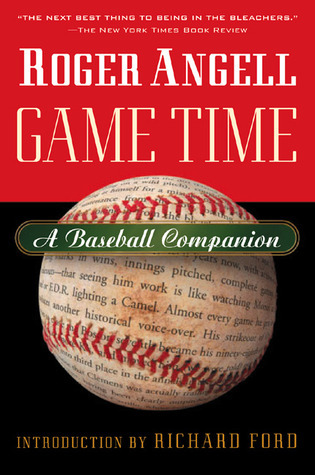 Roger Angell writes very well, fills his books with so many interesting tidbits about the game, and does it in such a way that you don't want to put the book down! I was a little saddened to have finished it in one day. Particularly lovely: an old essay about watching the 1981 New Haven NCAA regional game between St. Johns and Yale with Smokey Joe Wood; Frank Viola pitched for the Red Storm and Ron Darling for the Elis. Loved that. Excellent, evocative long-form baseball writing. I really enjoy having the ability to pick up a book randomly, and knock out 30 pages of self-contained narrative without having to remember where I left off. "Distance" is one of my favorite articles on an athlete, ever. Absolutely perfect collection of beautiful baseball writing by Roger Angell. I could live inside this book; it made me so happy. Some interesting articles and some that seemed dated. Worth a read but I would probably pick and choose which articles to read. Arguably the best baseball writer of all time. Priceless essays. I am reminded of someone who talks constantly because they love the sound of their own voice. The master of baseball lit. The perfect mid-winter read. Angell's pretty essential reading for baseball fans. Highlights here include writings on Bob Gibson, Tim McCarver, and pitcher durability. Basically awful. "Heigh-ho, these Yankees!" Ugh. Give me Joe Posnanski's personal yet analytical sportswriting any day instead of this flowery yet empty fluff.